1. 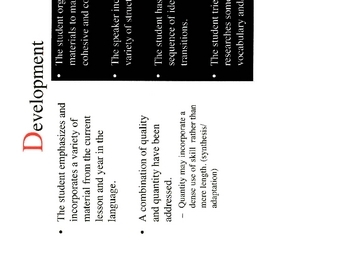 Engish Rubric explanation I've used at every level of French I've ever taught for projects and speeches. 3. An extensive list of feedback phrases in French. 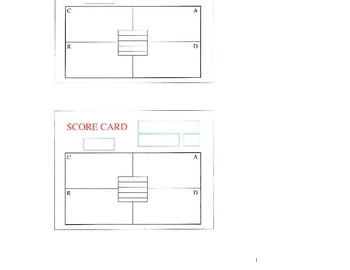 This rubric is based on an acronym of the term card in "Score Card". 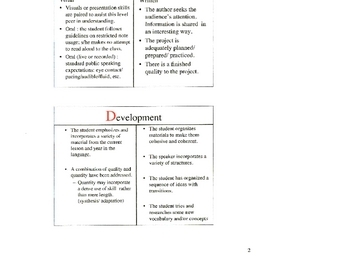 It includes multiple views to explain the rubric visually in class, use the layout you like the best from four small boxes on a page to a more reader friendly two boxes per page which can be printed front and back. The scoring sheets you csn choose among 2 to a page and 4 to a page layouts you can use to score speeches or projects to provide feedback to your kids. There is also a phrase sheet I included of more than 80 feedback comments in French you can write on projects which is very helpful when trying to evaulate work and praise students which I believe was generated in a conference some time ago. I was growing tired of creating both an assignment description and a rubric for every project I did. (I have several levels of French preps each year and a love of changing things up.) This rubric pushes for quality yet lends itself to every project I've done since its creation. It has enough structure that my sequential learners feel supported and know what I expect, but it open ended enough that they shoot for the moon on projects. This is a huge time saver for me on printing, grading, communicating my expectations, and giving feedback to build my students' confidence. I hope you like it!